American introduces extended reservations. Hold a fare for up to seven days. 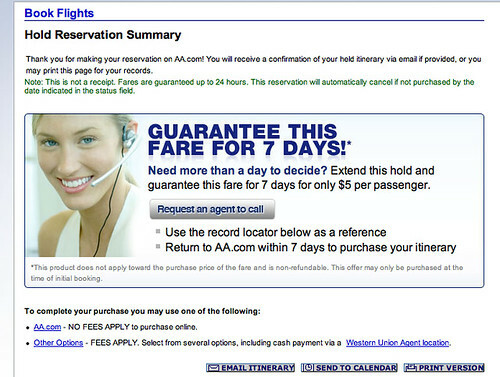 If you haven’t made a reservation in the last few days, you may not have noticed a new feature that American Airlines is testing at AA.com: You can now hold a reservation for up to 7 days and lock in your fare for only $5. One of my favorite features at AA.com is that for as long as I can remember, American has been the only carrier that allows you to place a 24 hour hold on a reservation. Over the years I’ve often had to travel with a colleague, a family member or a friend, and have frequently ended up being responsible for organizing the trip and making air travel arrangements. Being able to make a reservation, hold a fare for 24 hours and then confirm final travel plans has been an invaluable feature. Every now and then I’ve come across a really great fare that’s too good to resist, but because I usually like to travel with someone else, I’ve wished that I could hold a ticket a few days longer in order to talk someone (usually my brother) into going with me. Sometimes, I’ll just put a ticket on hold because I see a great fare and then check to see if I can find a good hotel rate. Today, customers can hold reservations for 24 hours or until midnight the next day without payment before the reservations are cancelled. You can still hold a reservation for 24 hours for free, let’s hope that never goes away, but this new feature is a nice improvement. Frankly, I’d pay $5 dollars just for the added convenience and flexibility that the extended hold offers.